Vaccinating your dog is a simple procedure that is routinely done by all veterinarians. Vaccinations are safe, effective and well worth the financial commitment. Many diseases that were once considered fatal to dogs are now under control due to the use of modern vaccines. When vaccinations are administered, the body produces substances called antibodies. These antibodies are produced by cells (called lymphocytes) which originate in the bone marrow and multiply in the spleen, thymus and lymph nodes. When the actual disease agent is encountered by the dog's body, these lymphocytes respond very quickly, producing antibodies that neutralize the disease. This rapid production of antibodies is only possible if the animal had been previously vaccinated. 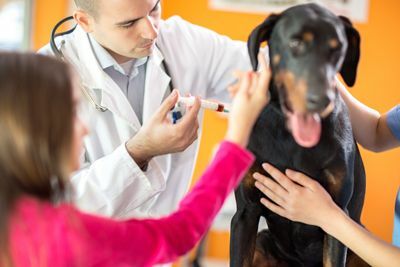 There is not a general rule regarding vaccinations; however, some basic rules apply to all dog vaccination schedules. At the very least, a minimum of two multivalent vaccines containing Distemper and Parvovirus are given three to four weeks apart to all puppies over three months of age. In most states, Rabiesvaccination is also required. Other diseases such as Coronavirus, Bordatella (Canine Cough), and Lyme Disease, require different vaccination protocols. Vaccinating your dog is a simple procedure. Only your veterinarian knows the vaccination schedule and the vaccines that are best suited for your dog. Remember, not only does your dog receive the proper vaccinations, but he or she also gets a thorough physical exam. This medical examination, along with some nutritional and behavioral advice, goes a long way in preventing problems in your adult dog.